Companies get excited about revenue growth, but global sales growth often raises concerns around transactional issues for businesses without a lot of export experience. The good news is that most of those can be handily addressed by technical experts. The bad news is that companies don't always know they need an expert, and may try a DiY approach. There are a number of risks to mitigate across a wide range of business disciplines. Some are straightforward, but some lurk in the background. Terms of carriage are an area which tends to trip American companies up. They know they need to plan logistics issues, but they're accustomed to thinking of transit cost and ownership/risk of loss in a "FOB Ship Point" vs. "FOB Dest" context. And failure to fully understand Incoterms2010 can lead to expensive errors. Incoterms is the abbreviation of International Commercial Terms which are established by the ICC (International Chamber of Commerce.) The latest version which is commonly referenced was published in 2010. For more background on Incoterms2010 check out the @exportgov article on the topic. In short, the terms provide a convenient lexicon for all parties, and define responsibility for various costs in addition to the transfer of ownership & risk of loss. 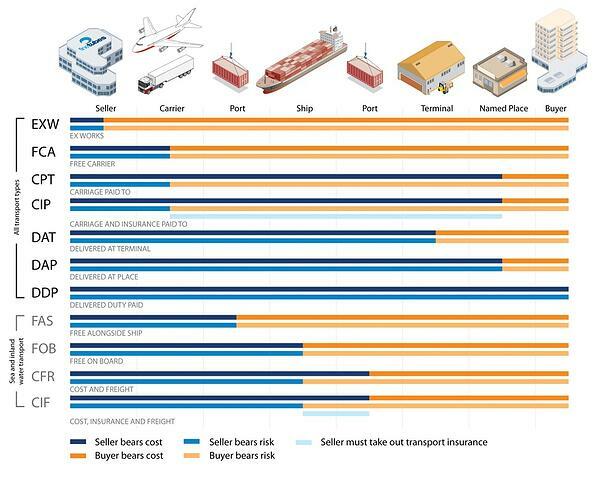 But most of the terms don't explicitly require the provision of any insurance, and this is where companies pursuing global sales growth, even those familiar with Incoterms2010, can err. a small difference in Incoterm can make a huge difference in cost (e.g. shipments into high duty jurisdictions) and easily erode any profit on the transaction. Long-term, profitable global sales growth is built on avoiding costly mistakes and building the right framework. Both take business savvy which isn't common among business experts. For instance, a freight forwarder will advise that you need to note an appropriate Incoterm, but often won't understand the parameters of your transaction and offer insight to avoid costly errors. Similarly a logistics provider will provide more robust recommendations on how to manage logistics costs, and help understand landed cost, but they may be unaware of the FCPA exposure inherent in customs clearance and the potential reduction in risk for companies that refuse to retain responsibility for that process. Of course that's no different than any area of business. There are accountants who fill out returns but never help clients to use finance strategically; there are marketers who crank out design without understanding the clients' markets; and there are legal advisors who answer specific questions narrowly but never ask the big questions that would enable them to provide guidance that supports your strategy. So the challenge is often not just finding a subject matter expert, but finding one with business experience which enables them to provide tactical advice which is consonant with strategic goals. Wondering how to pick the right export advisor to support your global sales growth initiative? Check out our free eBook.